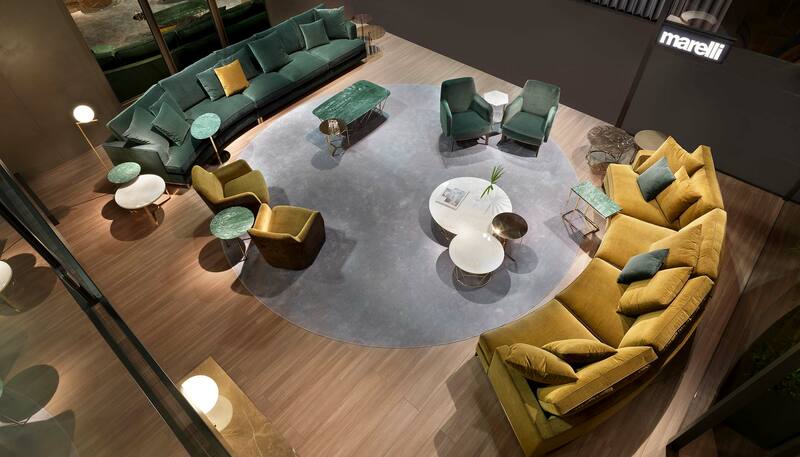 Our 2019 presentation at the Salone del Mobile in Milan was a celebration of elegance, glamour and precious fabrics and finishes. The Luxury Velvet Collection is being further developed, thanks to the introduction of some new models and to the collaboration with some world-renowned textile editors such as Rubelli, Dedar, Sahco, Misia, Zimmer+Rohde and Casamance. We presented some new comprehensive programmes, which were highly appreciated by the visitors, such as the Clipper collection, including a series of armchairs and sofas, but also a modular programme of sofas for modern and sophisticated residential or contract environments, the Kyoto programme, with dining and coffee tables, but also with some elegant pieces of wooden furniture with the same fine metal base and marble top. New is also the very peculiar Moon collection, with round sofas and ottomans, covered in a fancy rosy velvet fabric. Besides these new models, we showed some models already in collection, such as Loft, with curved elements, Matheus, also in combination with Andy, Lancaster, the Paris and Joy armchairs and the new chairs Grace and Chia in a new version with a particular golden metal base, accompanying the stylish Kyoto, Twig and Tatlin dining tables. Great emphasis was placed also on coffee tables, increasingly contributing to create elegant and sophisticated environments. The different areas of the stand were decorated with the Kyoto, Break, Clip, Clip Hexagonal, Frame, Twig, Tatlin, Elle, Mini, Leaf and Thor tables, presented with exclusive marble, metal, glass and wooden finishes. The fancy atmosphere was also reflected in the Reflex mirrors, with bronze glass and metal frames, also in the new round shape. Take a look at the photo gallery!